Teresa (Tae) Kidd is the department’s Research Grants Manager. She facilitates all proposals and pre-proposals and acts as the point person for all grant applications. Kidd also assists faculty members, principal investigators, and other staff with oversight of ongoing research budgets. 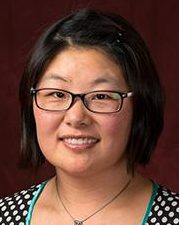 Prior to working at UW-Madison, Kidd spent six years teaching English in South Korea. She holds a B.A. from Marquette University in English literature, communication and rhetorical studies, and a master’s in library science from the University of North Texas.